Picture Bible Code: Nebu is weighed in the balances! And, Hurricane Charley. "How the gods of Babylon are Weighed in the Balances." The scales of light on the night Babylon fell to the Persians (539 BC) are here portrayed as weighing the gods of Babylon in the balance. The picture-bible-code is found in Isaiah 46:1-6, with the surface text also referring to this very same moment of time. "Bel bows down. Nebo stoops low...they themselves go off into captivity," (Isaiah 46:1-2). Here, Nebo bows low on the scales---being found wanting (too light)! The connection between Daniel 5 (of the writing on the wall) and Isaiah 46 is further made evident in that the silver and gold used to make these gods (Bel and Nebu) is said to be "weighed in the balances." As a matter of fact, the full picture (including the river) ends on the very word of the surface text, "weighed in the balances," which is "shekel" (tekel) in Hebrew. The mene-tekel bible code and hand bible code (also of Daniel 5) interact with this picture code (of Isaiah 46:1-6). Nebuchadnezzar was the father of Belshazzar. The writing on the wall was addressed to Belshazzar that fateful night when he was slain and Babylon fell. And with the falling of a king goes the fall of his gods. "...They themselves go off into captivity," (Isaiah 46:2). Nebuchadnezzar was named after Nebu (Nebo) and Belshazzar was named after the god Bel (also called Marduk). Ironically, though king Nebuchadnezzar was the father of Belshazzar, the god Bel was considered the father of Nebu. When Belshazzar was weighed in the balances that night, so was his god Bel---and likewise his son Nebu. Thus, Bel and Nebu are the demonic mimic of the Father and Son (Jesus). Bel was chief god and Nebu (his son) was the god of wisdom and literature. Contrast this with Jesus who is called, "The Word of God" and, "The Son of God." Nebu was said to impart the 'light' of wisdom; similarly, Jesus is called "the light," and "the lamp." Thus, fittingly, we here have a contest on these very scales of light. The contest is this: Who is really like the Father---the only true God? Is Nebu, (or his father Bel?) Or is it Jesus Christ of Nazareth? This, of course, is the very thing the actual surface text of Isaiah 46 is itself portraying. 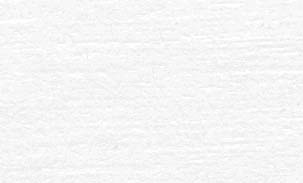 Thus, the picture-code agrees completely with the surface text. Both are portraying a contest between the gods of Babylon and the One True God. Now comes the amazing part! However, the words, "And Son," backward read, "Nebu." Hence, it reads, "The father," "Nebu," thus calling attention to the fact that the god Bel and the son of Bel (Nebu) are equally found wanting on the scales...They miss the mark! They sin and fall short of the glory of God, and they and their puppet king go off into exile and death. However, what is the contest? Certainly the gods of Babylon fall short of God's glory morally. But here we have a competition more striking. The issue is this: "Who is the true Son of God? Who is the real Word of God? Is it Nebu (the god of writing and science---the god still ignorantly worshipped in our colleges and universities today), or is it Jesus?" Before it was Jehovah against Bel, as in the days of Elijah, but now it is the Son of God against the the son of Bel! And Jesus wins! The fire falls, "A fire will certainly come," reads the trunk of the scale, "Yes, I am the Lamp!" But how does Jesus win the contest? Let Nebu (the god of literature and science) encode a complex image like this within any of his own writings by the magic of his science...if he can! But let it be perfect numerically, pictorially, and textually, so as to interpret the surface text, interact with other picture codes, and foretell the future accurately by it, all the while proclaiming the glories of Bel by means of countless wordplays! Several books could be written on the numeric of this bible code alone---even the days when the picture codes were discovered were on the anniversaries of when the Law (of justice) was given to Moses, and when the Law was broken at the golden-calf incident. And there is yet coming the fire of famine---a time of great inflation upon Babylon. "And when he opened the third seal, I heard the third living creature saying, Come. And I saw, and behold, a black horse; and he that sat thereon had a balance in his hand. And I heard as it were a voice in the midst of the four living creatures saying, A measure of wheat for a shilling, and three measures of barley for a shilling; and the oil and the wine hurt thou not," (Revelation 6:5-6). Encoded by means of the location of the letters in the book of Isaiah within the picture-code are the dates of the first fruits of the barely harvest, and also of the first fruits of the wheat harvest. then it is a fulfillment of this code. An economic depression is what is mainly being forewarned by this code. of the bible codes on the right mean?" The same night that I put out this document, (Pub. Aug. 3, 2004, 10 pm) unknown to me, the Olympic flame reached a pivotal point in its journey in Greece. Here is an excerpt from the official Olympic website as to this special day of the passing of The Flame. Note the glory that they heaped upon their ancient pagan gods. The true God is a Jealous God! God calls for a contest of His own---as said earlier. The actual Olympic contests began 10 days later on Friday the 13th---the same day when the hurricane struck America twice---the worst in 12 years---the same day that the Lord showed me the axe laid to the root of the tree along with the rod over the river---this day was also 365 days after the great blackout that fell over a large potion of the USA and Canada. I do not believe these things to be coincidental---but neither is this the main judgment implied by the code. The hurricane(s) is just preliminary---just as the fall of the Twin Towers was preliminary to the Iraq war, which was the explicit fulfillment of the mene-tekel code. This new bible code again builds upon the previous picture-codes before it. This new code strongly suggests a coming economic depression. The hurricane put the lights ('lamps') out for days for over a million people (like the Great Blackout one-year earlier), and felled many 'trees'. When I discovered in the picture-code this axe-to-the-root, I sensed the Spirit of God saying: "The axe is laid to the root. Judgment begins!" (This was about 4 pm, Aug 12, 2004, and again repeated on the 13th). Thus, the contest with Bel (Baal) began! (See Isaiah 46:1, which is where this code is found). Baal was the storm god, and his son, Nebu, was the god of science. God challenges Baal and son to repeat this picture-code that went out on the Net the very same day the gods of Greece were praised in anticipation of the Olympics games, (Aug. 3). And then, 10 days later on the first day of the Olympic games this great storm (hurricane) struck. The scientists were baffled by it in that it suddenly intensified, missing its mark by about 90 miles, catching them by surprise. O' Athens---city of the Olympic games! Athens supposedly had its beginning when the (supposed) goddess Athena created an olive tree in a contest with the sea-god. Poseidon struck the ground with his trident and a spring appeared. However, Athena won! Well then! The Only True God likewise requests a contest with Baal and Nebu! Let the Olympic games begin! Here is His Olive Tree O' Athena! (And olive oil for the lamp as well!) And here is His spring from the rock O' Poseidon! (This is that rock that Moses struck, [Ex. 17:6], "and that rock was Christ," [ICor. 10:4]. Yet, Jesus was struck with a spear/javelin in His side as He hung there upon the tree---"and blood and water flowed out," [Jn. 19:34])! Is not the notion of a contest the very theme of Isaiah 46 (and surrounding chapters), wherein the picture-code is embedded? If one objects, complaining that this is uncharacteristic of God, that one should read their bible! It is interesting that Greece (on Friday the 13th) honored their gods by lighting the altar (a phallic symbol) with the Olympic Flame. Note the parallel to the code: The middle flame of the Lamp in the picture-code is lit by the phrase, "My fire will surely come." Given the timing of the code, I believe that this phrase is alluding to the world Olympic games, this time held in Athens, Greece---the land of its origin. But God, too, has an altar to light, and indeed did light it 2000 years ago (720,000 days) at the cross. Even on the Google search engine, every day there is a different god portrayed as shooting at a target. Today it is an image of the goddess Athena shooting an arrow and getting the bows eye. The god (Satan) of this world is boasting! Moreover, it is interesting that the first half of the seven flames in our picture-bible-code read: "Did (Jesus) miss the mark...?" (ending on the same middle flame that read, "My fire will surely come!"). The torch has come! The altar is lit! As a matter of fact, do I see a Fiery Spear/Javelin in the hands of the menorah-tree of Justice---that is, in the hands (handles) of the balance of "The appointed King"? Or perhaps it is a sword? But the javelin is, after all, in the correct position for a throw---balanced precisely dead-center on the balance! Or perhaps it is both? "Let him who can, let him receive it," says the Lord! And indeed He did receive it---even in His side! "And yes, a sword will pierce your heart too!" (Luke 2:35). Here is a quotation about the proceedings concerning "The Olympic Flame" on Aug. 3. (The picture to the right is the actual scene dramatized at the opening ceremony on the 13th). Olympic website: "The Flame will stopover in the stadium at Delphi to poetry and music as celebrations continue all night. The relay reached the temple of Athena Pronaia at 8.30 p.m. to the stirring sound of the antique pipe. A choir was in wait at the Castalian fount to take up the ancient rite. As the Flame approached the house of Sikelianos music gave way to poetry, with lines from this poet being recited. The Flame entered the temple of Apollo to the notes of an Orphic hymn. There it encountered the choreographer Maria Hors, intimately bound up with the birth of the Olympic light at Ancient Olympia. Mrs Hors kindled the altar. Among the Torchbearers was priestess Anna Skoulikidou. Delphi's mayor Panagiotis Kaltsis greeted the Flame with the words: "From the Navel of the Earth and the cradle of the universal heritage of civilisation we send a message of hope. We send the rose of Greece to the peoples of the world. The Olympic Games are a festival of the citizens of civilisation"...And there was more to come, the night long." "According to historic records, the first ancient Olympic Games can be traced back to 776 BC. They were dedicated to the Olympian Gods and were staged on the ancient plains of Olympia, famous for its magnificent temples of the gods Zeus and Hera. They initially had a religious character and combined a number of ancient sporting events, many of which were based on ancient Greek myths." "A number of Greek myths are directly connected to the ancient Olympic Games and add a symbolic dimension to them. According to the ancient Greeks, Greek heroes and gods were the ones who held the very first Games. Many depictions of these mythical figures and races can be found at the 5th century pediment and metopes of the Zeus temple in Olympia." The official grand opening ceremony on Fri. Aug, 13th (the day of darkness), likewise glorified the gods of Greece, (who are really just the gods of Babylon with other names---the gods of the "New Age"). I believe that America was singled out for the hurricane because America dominates the Olympics just as she does the world. The axe handle reads in a circle, "And so He was circumcised/cut off," with the rest of the axe reading, "A Savior." Thus, together it reads, "A Savior (Jesus) was circumcised/cut off." The connection between circumcision and the river. The Jordan-river crossing (with Joshua and the children of Israel) is before us here in this image, (at right). (This assumption is strongly backed up numerically, though the Mountain picture-code at the burning-bush connects it to Mt. Horeb (Sinai) as well, where the river flowed from the rock. Notice how that composite picture-code of the fiery Lamp intersects the fiery Mount so as to form a cross. The similarity between this code and the new code are striking; thematically, numerically, and pictorially. The one aids the other in interpretation). The letters that form the two rods (or rod and axe) are at 7 x 5-letter skips (= 35). Since the bible code is on a ten-times basis, therefore these '35' letters convert to 3.5 years, or half-seven. The number "3.5" is the number of "cutting off," (i.e., seven-years cut short), and hence agree with what the words themselves saying, "They cut off (circumcised) Jesus." It should be noted that the ministry of Jesus lasted 3.5 years, and then He was "cut off," (Daniel 9:24-27. See also Revelation 12). The spot in the code where the line (rod) crosses the river corresponds precisely to the spring of AD 425, which is exactly 2300 letter-years (also to the month!) back to when the house of Israel (Jacob) descended into Egypt to escape this seven-year famine, where they remained exactly 430 years until the exodus, (1876-1446 BC). ("AD 425" also corresponds to Pentecost morning, (i.e., 360 + 65 days = 425). Pentecost is the anniversary of the giving of the law to Moses (1446 BC), and of the baptism of the Holy Spirit (AD 30) wherein 3000 were baptized by fire and water that very same day, (Acts 1-2). "AD 425" (this symbolic date represents Pentecost of 1445 BC) is also the date (Pentecost of 1446 BC) of when God intended Israel to Passover the Jordan, as explained in a document put on the net several years ago. Hence, the numeric of the code is exact to the letter of all the letters in the book of Isaiah so as to signify the crossing/baptism in the river by both water and fire. This agrees with the prophet Isaiah, (as recorded a little before the place where the actual picture-code is embedded [Isaiah 46:1-6]). (Isa 43:2) "When thou passest through the waters, I will be with thee; and through the rivers, they shall not overflow thee: when thou walkest through the fire, thou shalt not be burned, neither shall the flame kindle upon thee." The axe handle reads in a circle, "And so He was circumcised/cut off," with the rest of the axe reading, "A Savior." Thus, together it reads, "The Savior (Jesus) was circumcised/cut off." Click here for the full Axe-Bible-Code and Hurricane-Jeannie code. Update, Sept. 23, 2004. [The Day of Atonement on the 360 prophetic calendar.] This bible code will be elaborated on shortly. In brief, the code is read along the squares much the same as in the mene-tekel bible code. The squares are read in alternating directions. It is first read descending then ascending the nine squares. "I will look with favor! I will save! He will lift up the heap of ruins and I will forgive. But to whom can He be compared and what is His likeness? I will save and I will forgive and they will be circumcised and I will forgive." Axe-Bible-Code and Hurricane-Jeannie code. Also see other article about the code overtop the river bible code that reads, "Smite Jesus!" Josh. 4:7 "Then ye shall say unto them, Because the waters of the Jordan were cut off before the ark of the covenant of Jehovah; when it passed over the Jordan, the waters of the Jordan were cut off: and these stones shall be for a memorial unto the children of Israel for ever." Josh. 5:13-15 "And it came to pass, when Joshua was by Jericho, that he lifted up his eyes and looked, and, behold, there stood a man over against him with his sword drawn in his hand: and Joshua went unto him, and said unto him, Art thou for us, or for our adversaries? And he said, Nay; but as prince of the host of Jehovah am I now come. And Joshua fell on his face to the earth, and did worship, and said unto him, What saith my lord unto his servant? And the prince of Jehovah's host said unto Joshua, Put off thy shoe from off thy foot; for the place whereon thou standest is holy. And Joshua did so." As the rod strikes twice in the picture-code (once at the river and once at the tree---both perfectly symmetrical), so thus the hurricane struck twice, (Aug. 13th and 14th, 2004); but really, (and this is crucial to know), it was Jesus who was struck (as the bible code itself says, "Judge...Strike Jesus!" ELS -60 x 7 along river); for, "In all their afflictions, He too was afflicted." God is not aloof from the suffering, but deeply cares---though He will not spare either. Can you not picture Jesus here being pierced at spear-point by the soldier in this image. "And they shall look upon Him whom they pierced," (Jn. 19:7). The words, "Strike Jesus!" end at the tip of the spear/sword!" See how His hands (handles) grasp the spear, and blood and water pour out! For it was the Tree of the Knowledge of Good and Evil that really hung Jesus upon that tree. "In all their affliction he was afflicted, and the angel of his presence saved them: in his love and in his pity he redeemed them; and he bare them, and carried them all the days of old," (Isaiah 63:8-9). Recall what the seven sacrificial flames read: "Did he become a sin-offering before the Father?" More could be said in the numbers---for they are very awesome. 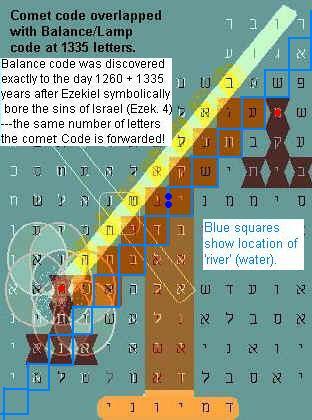 The weighing-scales used in Ezekiel's prophecy about the 390 and 40 (= 430) days/years, (Ezek. 4) is also very crucial to the code. The theme of "bearing up" connects the thoughts in Ezekiel with Isaiah 46:1-6 wherein this code is embedded. And this same code came to me on June 27, 2004, which is 1260 + 1335 years (Revelation 12 and Daniel 12) to the very day (on the 360-cal.) from when Ezekiel finished laying on his side 390 days (a day for each year) "to bear the sins of the house of Israel." It is also "the house of Israel" that is being borne up in the right hand (handle) of the balance! Also see other article about this code overtop the river-code that reads, "Smite Jesus!" In ancient times, money (silver coins) were weighed out on scales---thus, the 'balance' is a monetary symbol, just as the picture-bible-code of the 'flag with 3 coins' is also all about money as examined in the Mene-Tekel-Peres Bible Code. Note: This note was written four years after what was written above about the coming depression. It happened that the depression/recession of 2008 began "1260 + 1290 + 1335" years after Joseph's seven-year famine began! Even the time frame of "1260, 1290, 1335" was mentioned in the above short prediction, although I did not know then when. The above quote can be verified because it was archived on the internet by www.web.archive.org. As the archive shows, the part about the "1260, 1290, and 1335" was added to this quote 3.5 years before the collapse of the economy, being added by May 7 of 2005, and the rest before that. May 7, 2005 happens to be 1335 days inclusive from the fall of the World Trade Center. See, "World Trade Center Bible Code: a Sign of the 2008 Collapse of World Trade", for more about this.